Just right for a tea table, this oak parlor table (oak lamp table) with its original finish and the dings of long time use, came home with us from an estate sale with a difference. The entire household contents were included in the sale to the new owners of the house and the new owners held a house clearance sale. No sad emotions, just commerce. I posted about an earlier oak parlor/lamp table that we found in pieces and DH rebuilt here and here. 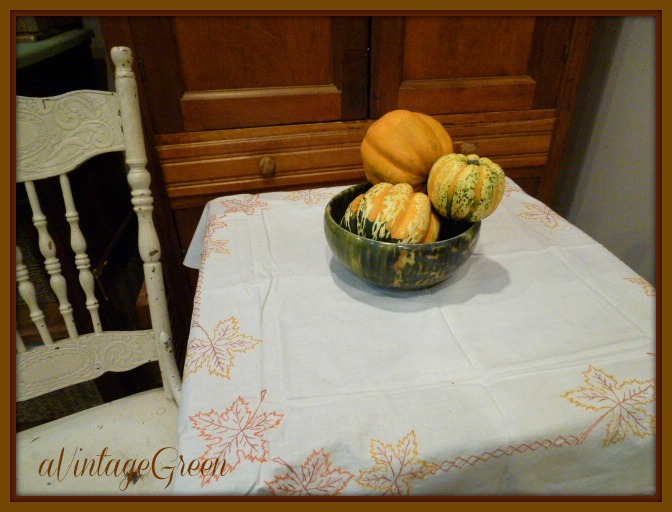 This table goes so well with the embroderied fall leaves table cloth from my vintage covers collection. 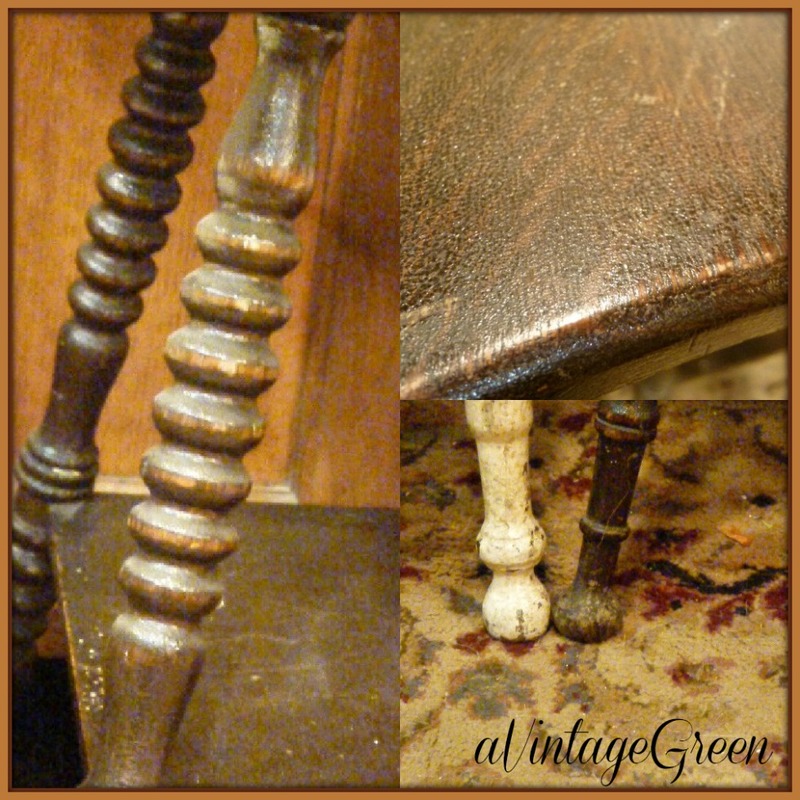 Close up views of the legs and the original finish. The fun is in the dressing and making vignettes is always a treat. I love the look of the marbled and burgandy covered books and the metal silver napkin ring and thimble on a paper holder in the mini cloche but my favorite thing this week is my Bue Roses double marked Paragon cup and saucer. It stays on my Welsh dresser - this is its first appearance in a vingette. Thank you to all the wonderful bloggers who hold parties so that other bloggers can share their projects, ideas, renovations, painted furniture, inspirations, great recipes, and so much more. The lamp table is just gorgeous Joy, a good find. You can never have too many oak tables around the house. I love it. Wonderful Oak Tables...they last forever...dings and all. Great finds and a lovely embroidered table cloth. It fit just right on the oak table. Happy VTT. I have a couple of very vintage tables like this. I inherited from family estates. 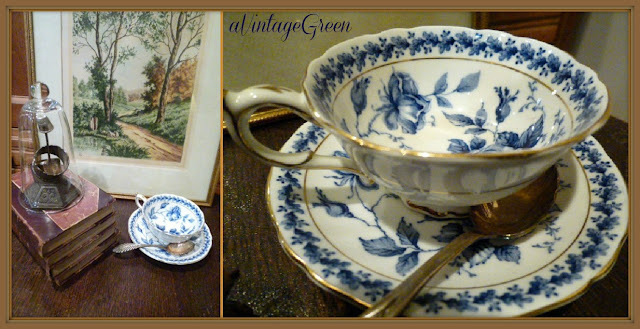 Great find, Joy :) And I love the blue tea cup. Have a lovely day! How lovely! I love barley twist. Thanx for sharing at THT! Joy - What a beautiful little table!! So glad you got it. 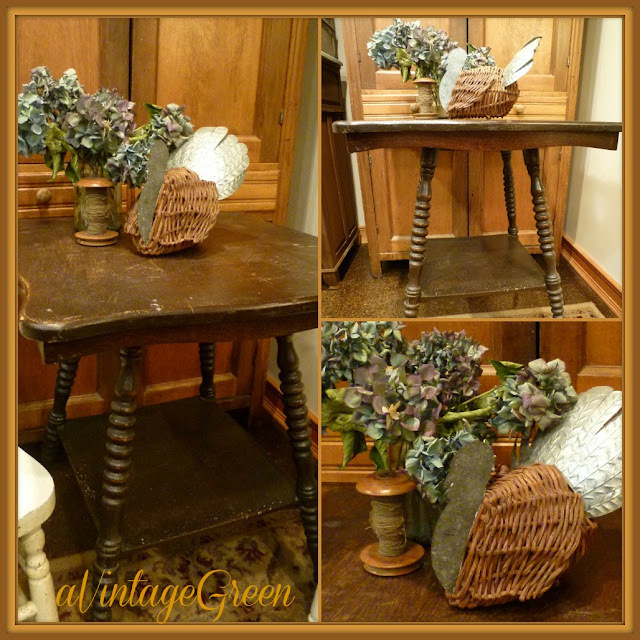 Really cute table with the time-worn look. You will find many uses for it. Love your vignettes. Wonderful table...your vignettes are always great. Loving the blue tea cup. A great table ~ lucky you ! And a beauty of a tea cup ~ that's my favorite. Love old wood!! Really nice! Oh my goodness, that cup and saucer are simply gorgeous. I can see why the set is your favorite thing this week, Joy. My daughter just bought a table like this one. Hers has claw feet with a glass ball on each foot. I'm sure you will enjoy your new find. So many uses for a table this size. Your table is very much like one I have! My aunt gave it to me after my uncle died -- it was the only thing he had that was his mother's. 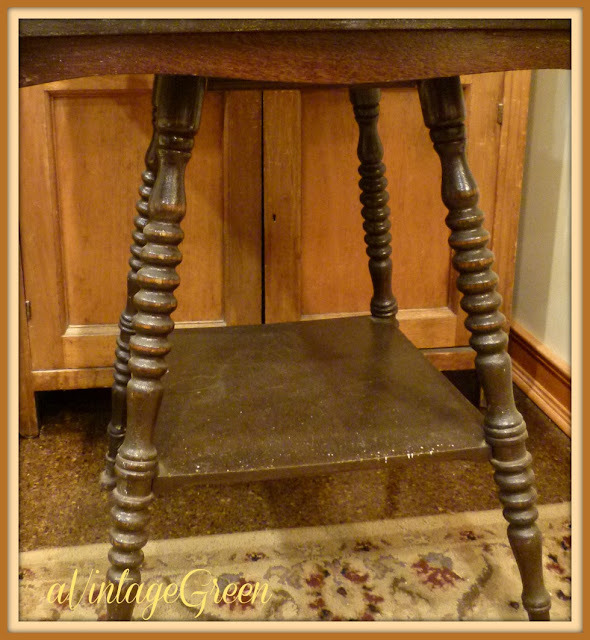 He had refinished it so, even now so many years later, it still looks lovely! I didn't know they were called parlor tables though! Oh I love that style of table ~ I think it's so charming. I agree that creating vignettes is the best part. Your blue rose cup and saucer is really beautiful! Love that table and the shapely legs. It will be a terrific place for so many items. 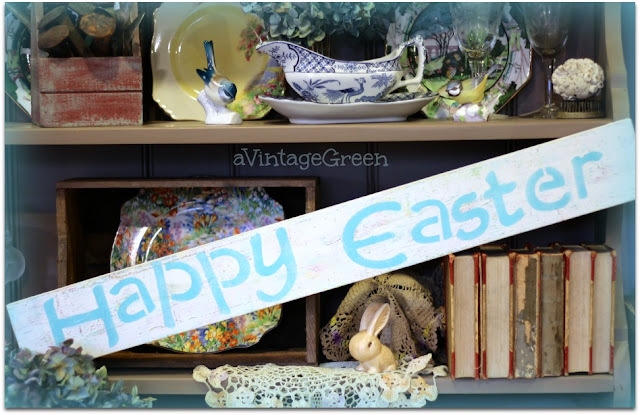 I know you will enjoy changing the vignettes to suit the season! Great table love the detail in the legs! The teacup is a beauty! Thanks for sharing at Cap Creations. The wonders you bring to life by your expet placing of things! YOU are amazing! I love that table! My grandmother had a table like that and I have always wanted one. Luckily I recently found one on CL for a very reasonable price. It has much more "alligatoring" (as I call it) to the legs, and the top had a lot of water stains. It is in line for a makeover, but I am so excited to have a piece that reminds me of my childhood and my lovely grandmother. Joy you did such a pretty vignette with that glorious picture (I LOVE dirt roads pictures!! ), and that gorgeous cup and saucer....and those marbled books are so perfect..all together it is so pleasing to look at! I'm excited you joined me for my party today! !